Sliding the Marin Palisades Trail out of the back of the van, we instantly noticed the sub-standard three-piece chainset and spindly, coil-sprung XC 30 fork and thought we’d grabbed one of the £600 bikes by mistake. Marin has spent its budget differently to most of the other brands in our Hardtail of the Year test, opting for a Shadow Plus rear mech that ramps up tension at the flick of a switch to stop the chain slapping about and bouncing off the chainrings. It has also specified sealed cartridge-bearing hubs that will keep the bike rolling smoothly long after the warranty has expired. But has it paid off? Yes… to a degree. The ride of the Marin Palisades Trail is steady, rather than inspiring, as it lacks speed on the climbs. 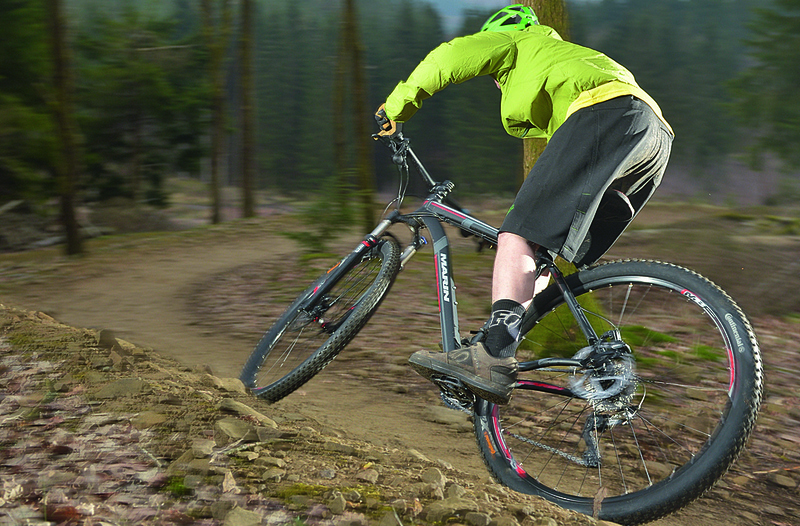 Point it downhill, however, and the wide bar, 80mm stem and ultra plush coil-sprung fork come into their own. The bike isn’t harsh and thanks to the Shadow Plus rear mech the only sound you here as you flow down the trail is the damper in the fork wheezing away like it has a 40-a-day habit. Could the Palisades Trail be better? Yes. There’s virtually no standover clearance on the 19in — dropping the top tube down an inch or two would be a huge improvement. We’d also like to see an inline seat post to get the rider’s weight further forward for climbing. Finally, the coil-sprung fork’s lack of adjustability means it’s not going to suit everyone; it really should be an air-sprung model at this price point.